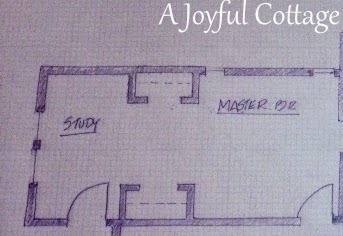 A Joyful Cottage: The Cottage - Is This It? 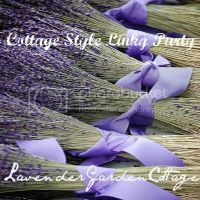 The Cottage - Is This It? "You wake up in your new cottage. Now walk me through your day. . .what do you do next?" "Well, I'd start with coffee with you," I said. "And if it's fair weather, we'd be outside on a porch or patio. And I'd putter between sips. 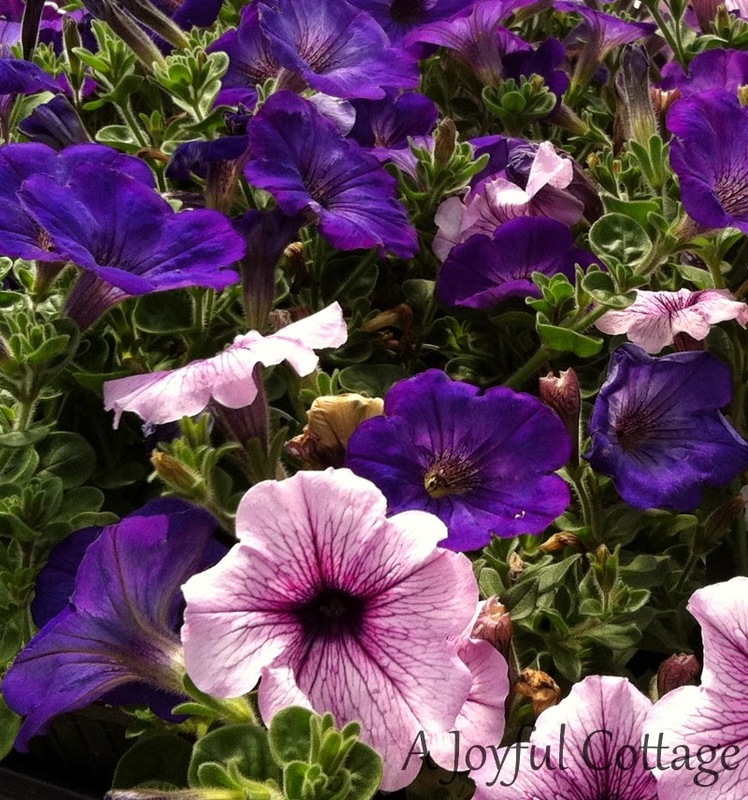 Photo taken at our local nursery. "I'd pull a few weeds from the flower bed. Not my garden. This is my neighbor's plot. I can dream, though. "I'm a farmer's daughter, I like to make things grow. 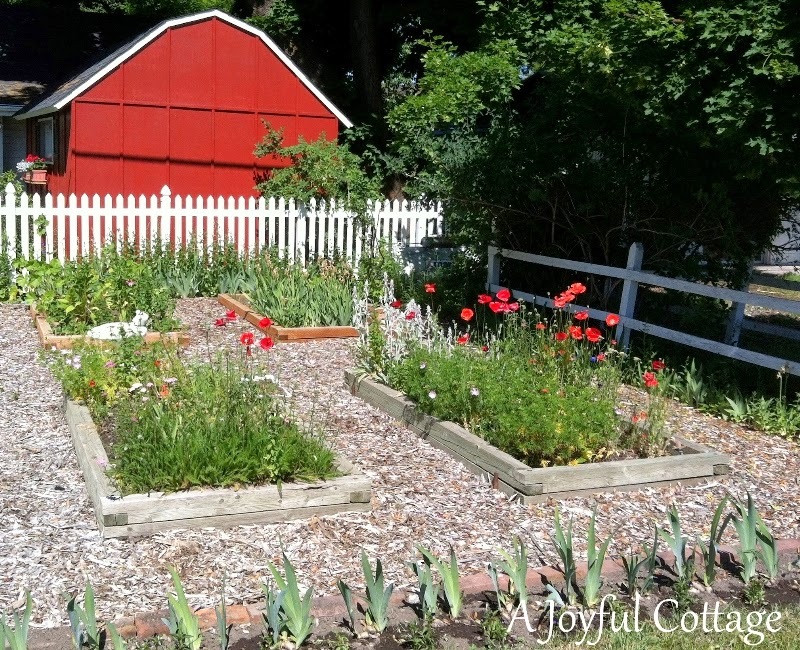 In the summer months I want to spend most days tending a garden. Or reading under a shade tree until I fall asleep." "So far," Captain said, "everything you've mentioned is done outdoors." "Yes, I like to take advantage of the warm days." "Winters are long here," I said. 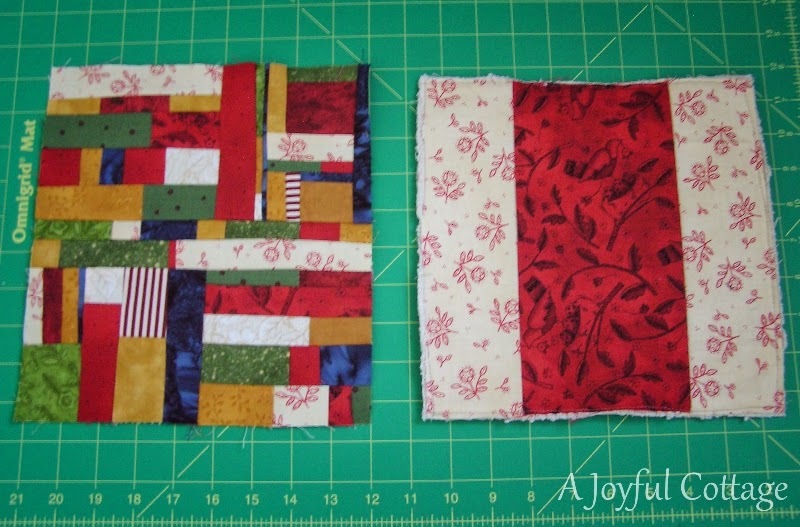 "During the cold months I'm quilting or doing other creative things indoors. 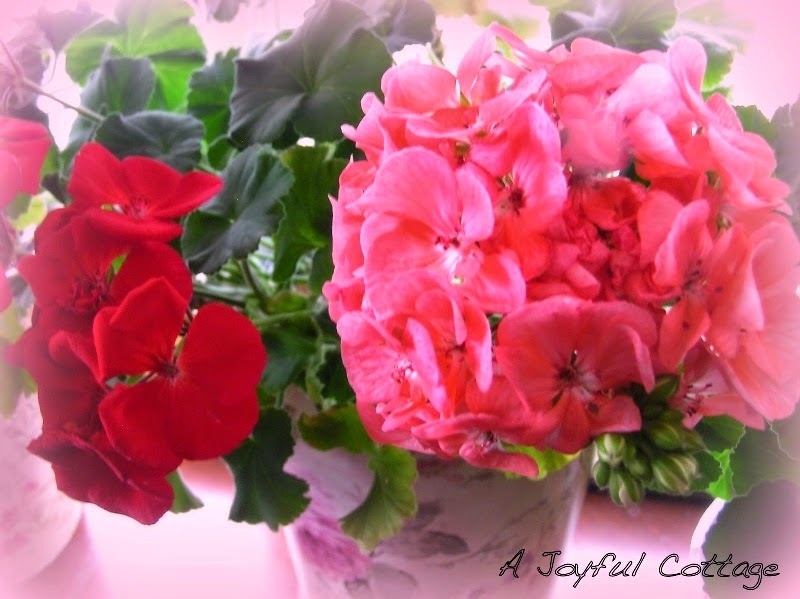 "And the flowers I grow are in pots in front of a south window. "Of course, all year long I write and blog." "You need your own space for creativity," Captain said. 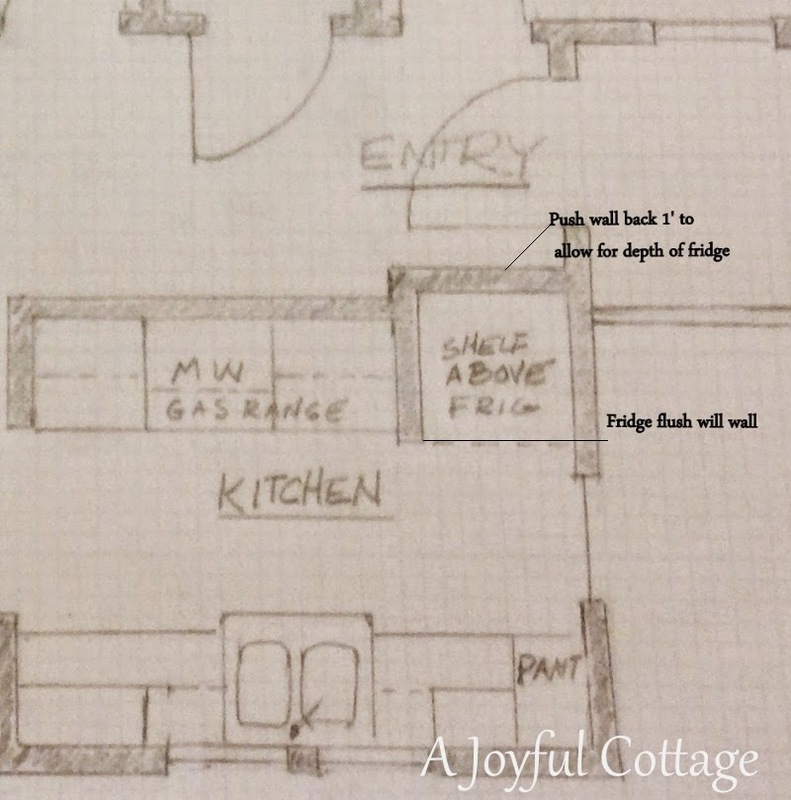 After asking a few more questions and running some ideas by me, Captain began sketching, and in a few hours he had a schematic of our cottage. 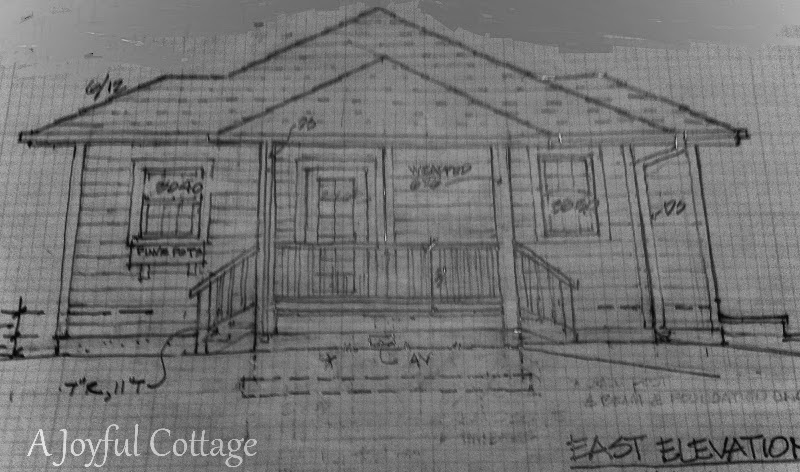 Over the next few days we tweaked it until we had the cottage design that satisfied both of us. 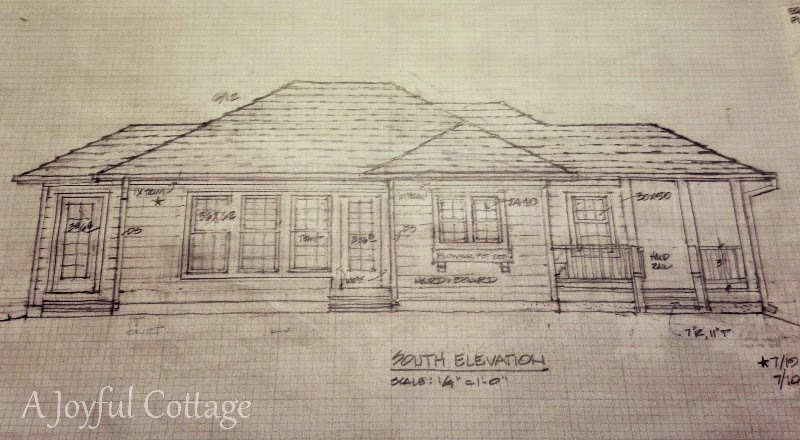 This is a 970 SF, single level, 2 bedroom, 1 bath cottage, with a study. This is the street view. The French door on the far left is the study (my studio). The three windows and French door in the center is the living/dining room. Two windows with a flower box under them give a view from the kitchen. There is a front porch, and the window you see behind the railing is Captain's studio. We moved the cottage farther back on the lot to allow for more landscaping on this side of the cottage. The window on the left is at the end of the kitchen, and the window to the far right is Captain's studio. The double stair porch frames the entrance. Here you get a side view of the porch on the far left. The casement window is on the north wall of Captain's studio. 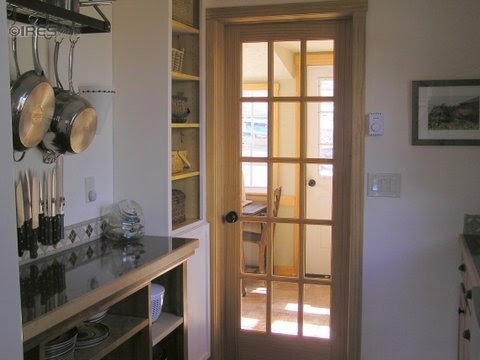 The French door gives access to the bathroom from the vegetable/flower garden. (More about this later.) The two windows on the far right are the master bedroom. The extension on the west side is my space (the study). You can see the two windows, and the little steps on the right that give me direct access to the south garden through a French door. We enter from the porch into a small foyer. Captain's art studio is on the right (Bedroom 2), and includes a bar sink for clean up. The proximity of his studio to the front door means he can bring art customers in and have privacy. There's a guest closet at the entry. I'll take you into the kitchen first, and then we'll look at the rest of the cottage. I've included some inspiration pictures for your viewing pleasure. Be forewarned, though, there are a lot of photos. This is a galley kitchen. You may be wondering why I chose this particular style. 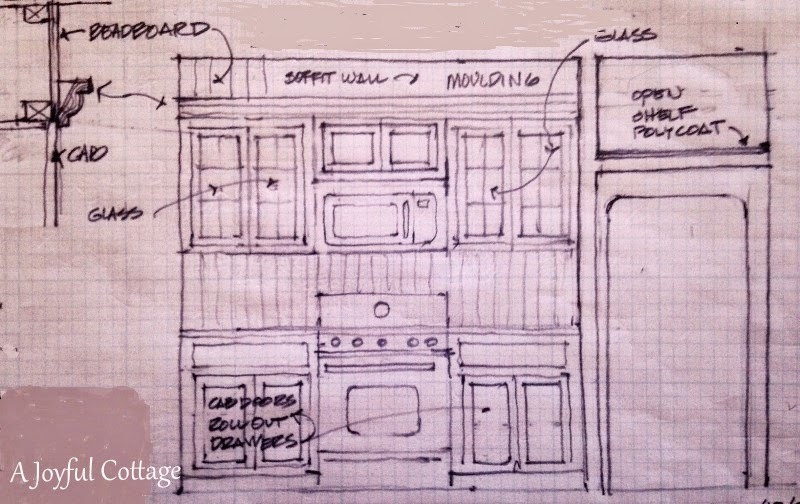 Most people don't want a galley kitchen. Well, I'm the exception to the rule. Our last home had a galley kitchen. Can you tell I have a thing for French doors? 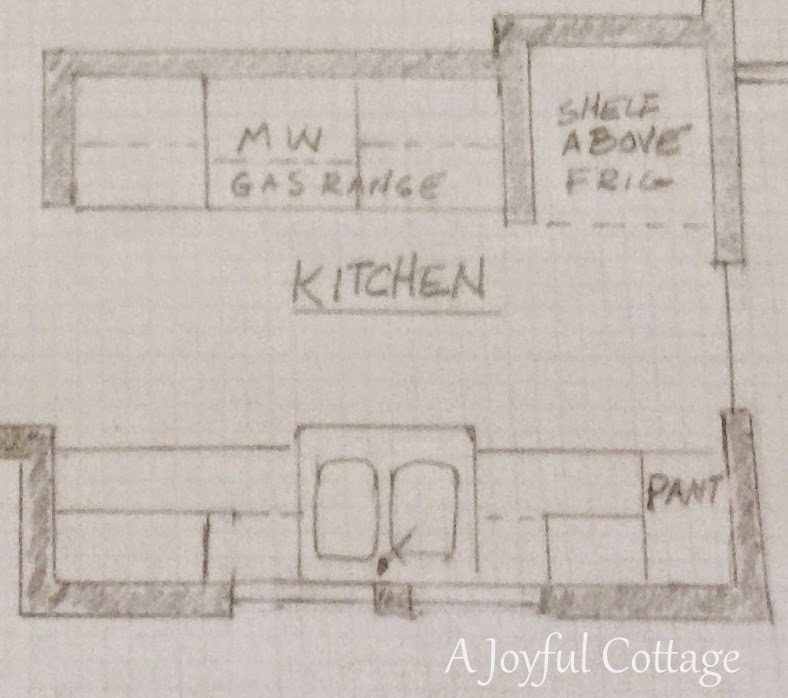 I've had kitchens ranging from one wall in a tiny apartment to a big kitchen with a huge island, and I find the galley kitchen to be the most efficient and enjoyable in which to cook. I like to have things close at hand, and I don't like having to take a lot of steps to get from one work space to another. 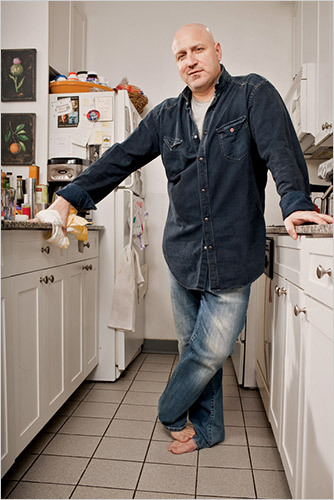 Tom Colicchi, the founder and co-owner of the Craft restaurants and head judge of 'Top Chef' cooks in a small galley kitchen in his NY rental apartment. He says, "I can’t open the refrigerator and the oven door at the same time. But you don’t need to have a Rolls-Royce kitchen to make a great meal." 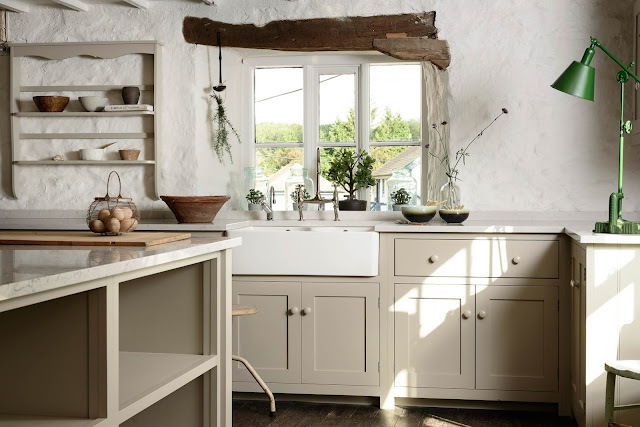 The key for me is having a kitchen with plenty of natural light, at least one 4' work surface and good storage. 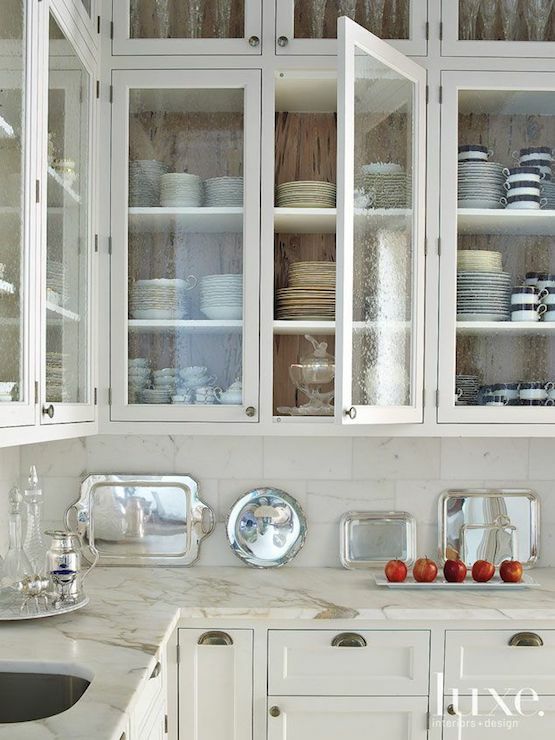 The galley kitchen we designed has all of this. I have no idea what the reddish marks are on this image. It could be I spilled salsa on the plan. Oops. 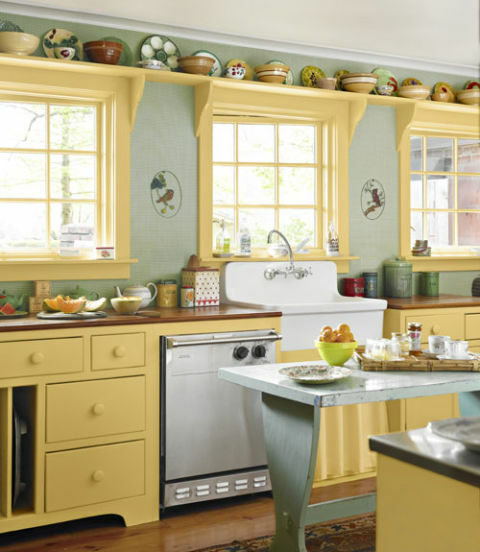 There are two large windows over the sink. The pantry on the far left is a scaled down version of my inspiration pantry. 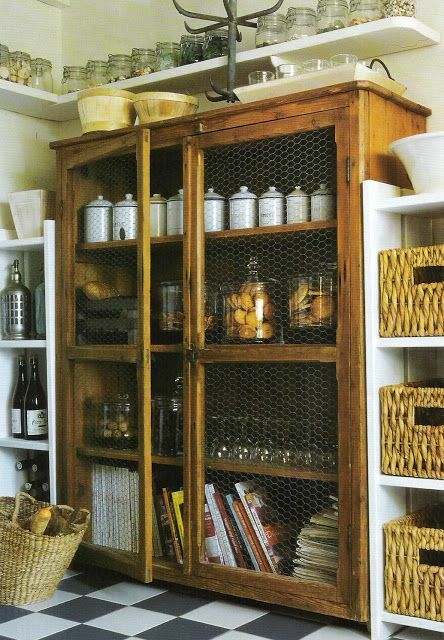 I love the raw wood and chicken wire. 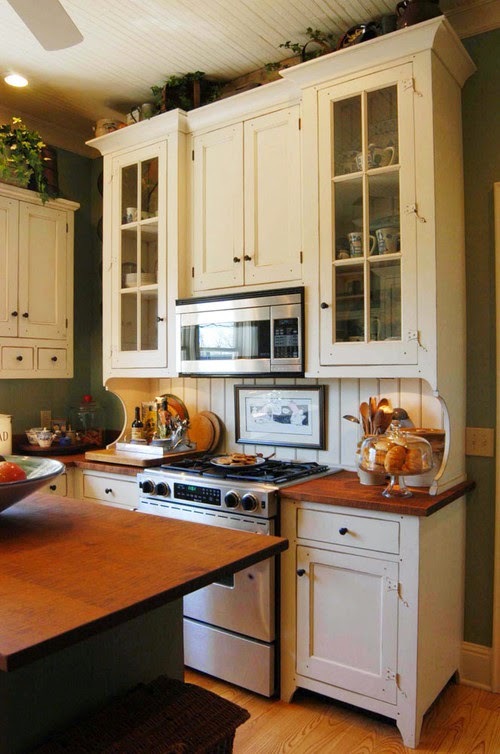 I've always wanted to do a kitchen with shaker cabinetry. Simple, understated. . .perfect. 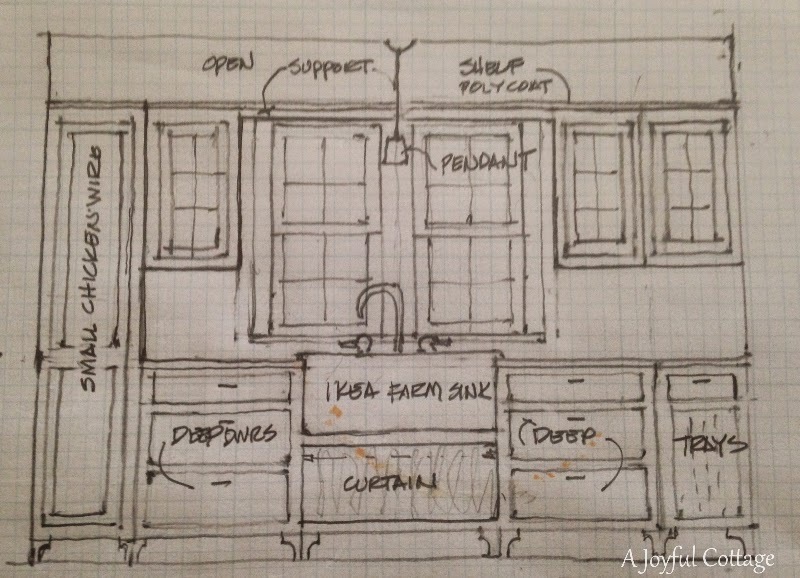 Upper cabinets will have glass front doors. 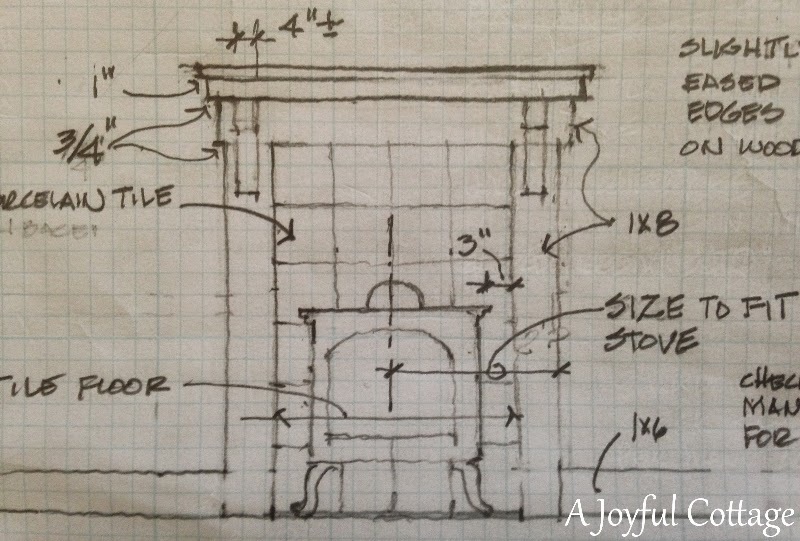 A shelf will be built on the cabinet tops that will run over the windows -- the full length of the wall. This will give me room for display, baskets for extra storage. . .whatever. I already have the Ikea farm sink. A friend was going to Portland and offered to pick it up for us. 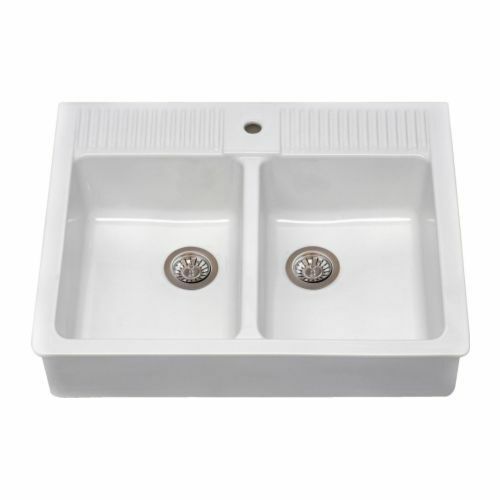 Since we live 5 1/2 hours from the nearest store and Ikea doesn't ship this sink, I jumped at his offer. He's so very nice. I will have a skirt under the sink. The opposite wall will house the range, otr microwave, and the refrigerator. 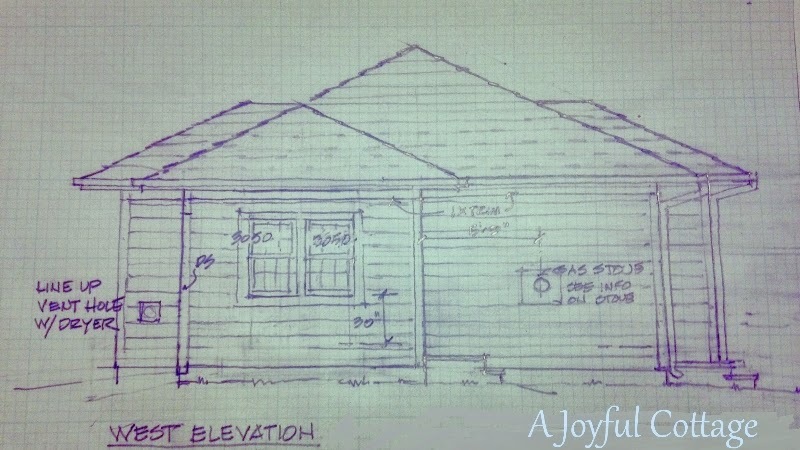 Remember my "hutch" inspiration photo from the other plans? It's moving with me to this plan. We'll be using beadboard behind the range, continuing on the soffit wall above, and we'll use the same beadboard on the sink wall. There will be a wall between the hutch and the refrigerator. Now here's why you should have an architect like Captain design your home: he pushed the wall behind the refrigerator back a foot so that the refrigerator face will be flush with the wall's edge. See why I love this man? No detail escapes him. He also gave me a window on the end wall, and that makes me really happy. Having natural light at the end of a galley kitchen keeps it from looking like a cave. The fact that all the kitchen windows have flower boxes on the exterior gets him extra points, too. I don't know, it's getting late. . .should we continue the tour? Yes? Okay. The dining and living room is one open space. Three windows and a French door provide plenty of natural light. In the summer this room extends to the outdoors. I can picture al Fresco dining just outside. Yes. The little gas stove and mantel is back. Ambience and an alternative heat source. Ahhh. The master bedroom is off the living room. His and her closets separate the bedroom from the study. I have to tell you that I absolutely am in love with this layout. I get my own space away from the daily activities in the house, it has lots of natural light and a French door to the flower garden, and it makes the small master bedroom appear larger. And now the bathroom. We're building a one bathroom home, for economical reasons, and how we design this bath is extremely important. This is a home designed for the way we live. I want to emphasize this because I believe the bathroom is designed very differently from what most people would want. As I mentioned earlier, there will be a working garden behind the house. Captain and I are both avid gardeners, and we want to be able to come into the cottage from the garden without making a mess in the entry and living space. 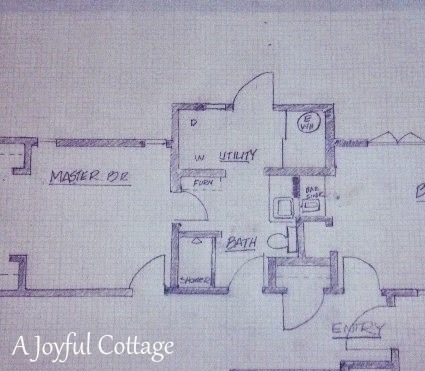 Many years ago I saw a beach cottage featured in Country Living that had one bathroom. There was an exterior door in the bathroom that allowed the family to come right in from the beach and bathe. I thought that was brilliant. So, when Captain approached me about designing the bath with an exterior door I was completely onboard. For us it makes perfect sense. A utility area with a closet separates the exterior entrance door from the bath. Dirty gardening clothes go in the washer, gardener steps into the shower, gardener comes out clean, dresses and there you have it. No tracking dirt through the house, and we have a lovely view of the garden from the bathroom when we don't need privacy. 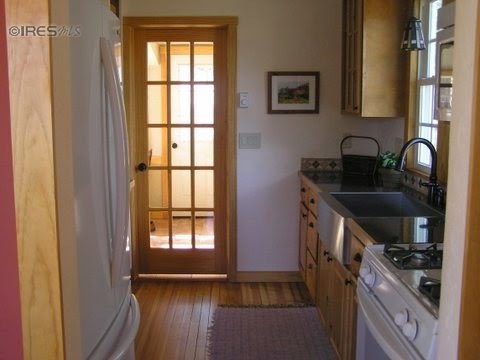 The French door has privacy blinds, and the bathroom is tiled, so it's easy to maintain. Of all the plans Captain has drawn, this is the one that quickens my pulse. I feel like we've hit the jackpot. Now we're waiting for the bid from the contractor. Thanks for your interest and encouraging words. I feel like you're taking this journey with me. I do hope you're enjoying it. This seems like it is YOURS. . . I like it. Love the roof lines. Like the separateness of your work space and study from your husbands studio space . . ,Charming Nancy . . .
First, I have to take my hat off to Captain: he asked you just the right questions and then drew an amazing cottage. My favourite thing is actually the door that goes from the garden to the bathroom... If I ever build a cottage, I'll copy that, it's brilliant! Oh Nancy!!!!! How beautiful, I love your choices and the layout seems perfect. I love that porch - can I have that bedroom please??? There you go. A design based on your lifestyle. Lovely! It is so pretty and I love the final design. I cannot wait to see your journey of getting this done. 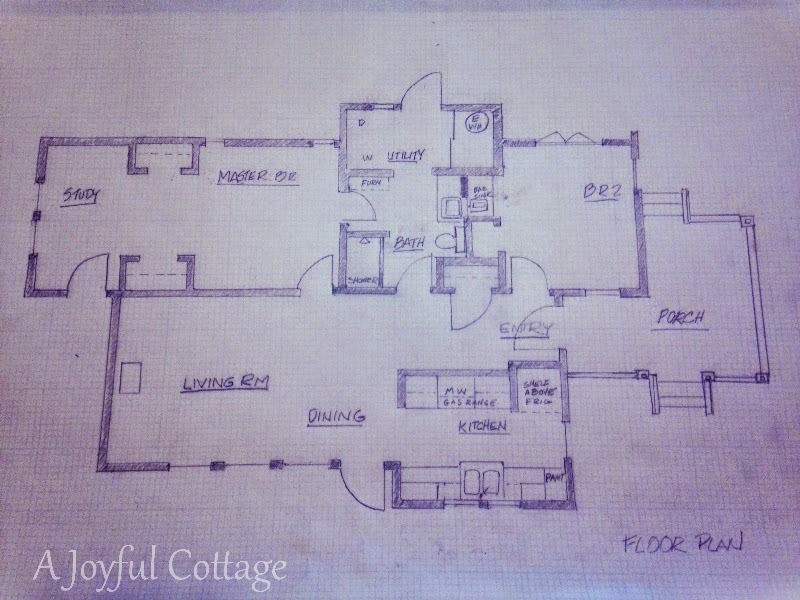 What a wonderful tour of your dream cottage plans. I loved every second. It's perfect! 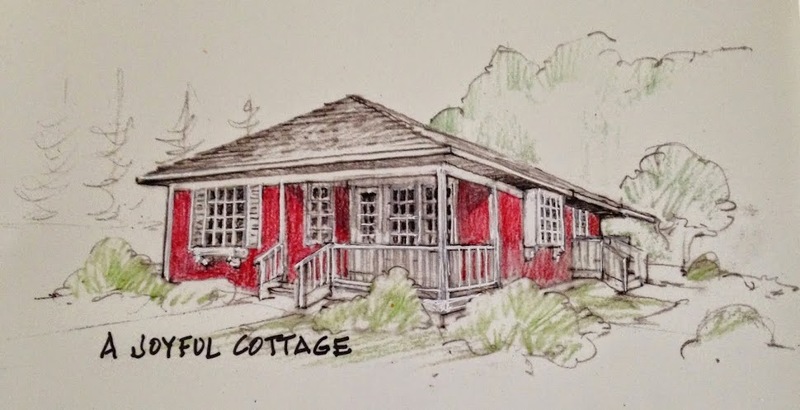 I love that you designed the cottage for YOU. 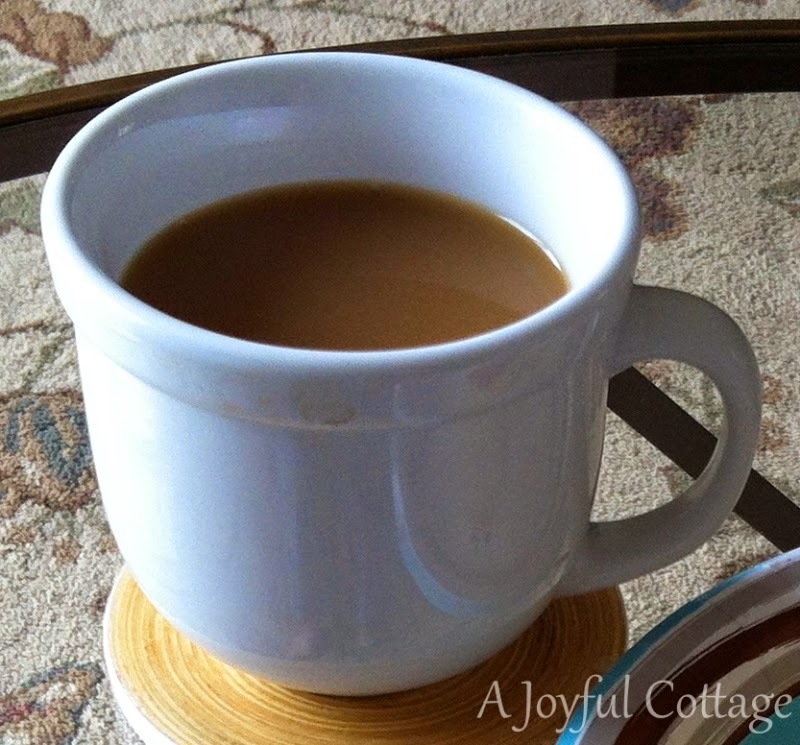 We live in a small cottage and I don't ever regret downsizing. We have enough space to do what we want to do and we use everything. I have a friend who lives in a 3,000 sq. ft. house and she never enters most of the rooms. 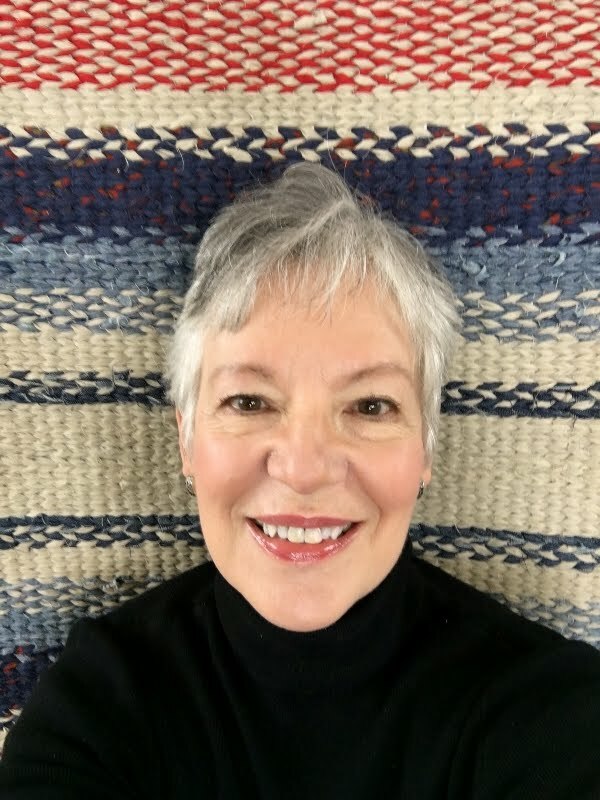 She is a successful watercolor and collage artist, but has never created a studio for herself in the big house because she doesn't want to have a mess out. 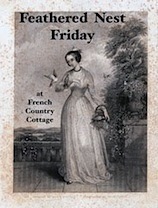 Your cottage will be well loved and lived in. I appreciate your kind words. I've lived in smaller homes most of my life and find them to be cozy and inviting, and I like having less to take care of so I can spend time doing the things I love. Thanks for stopping by. Nancy, I'm just tickled and can't wait to see it come alive! I have never lived in a home with a gallery kitchen, but looks fun and functional to me! I love this plan! I can totally see how this would work. 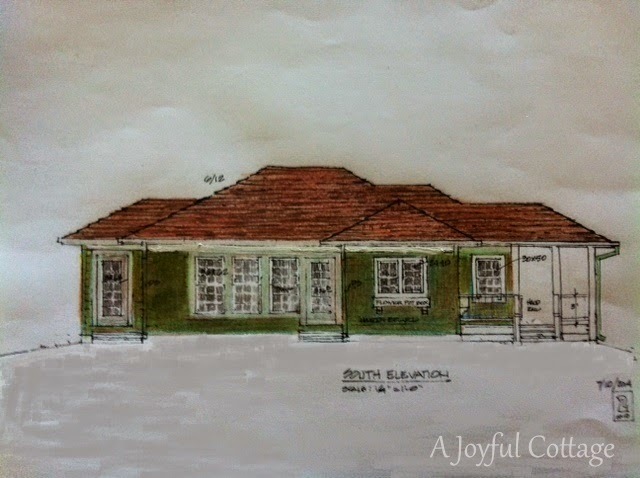 Envious of your exciting planning and building project, and hope you have lots of fun through this exciting time and after your home is built. Forgot to say I'm your newest follower. 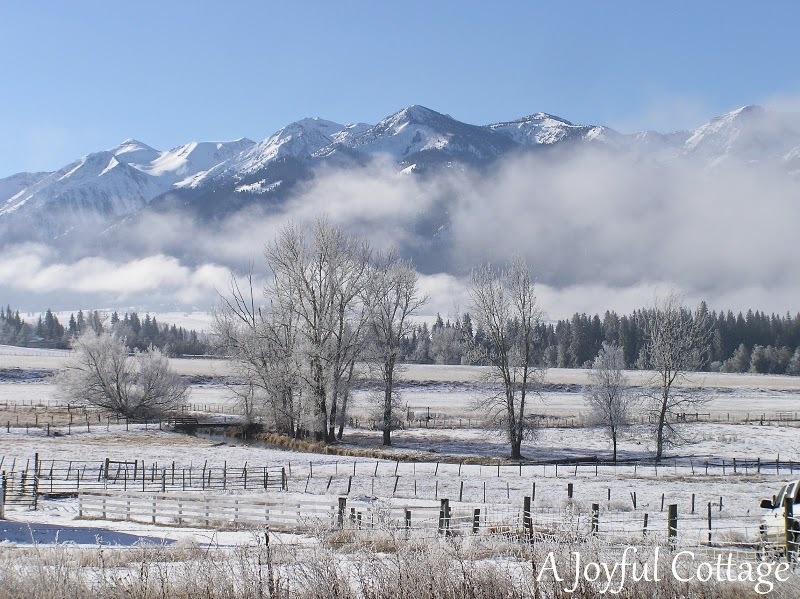 Would love for you to visit and follow me back at www.thebfarm.blogspot.com.